The Guadalcanal-blooded 1st Marine Division’s assault on Cape Gloucester in western New Britain on December 26, 1943, was unconnected to the preceding seventeen-month slog along the nearby Solomon Islands chain. Nor did it have anything to do with the neutralization of the Japanese naval and air fortress at Rabaul, on the eastern end of New Britain. True enough, the Cape Gloucester invasion happened to strategically isolate the vast Rabaul logistics base from Japanese-held areas in nearby New Guinea. But the invasion of Cape Gloucester was a tactical operation aimed at preventing a pair of badly built airfields from supporting an effort to interdict the passage of two Australian Army divisions then fighting their way along the New Guinea shore adjacent to Vitiaz Strait. On the eastern shore of Vitiaz Strait, the Cape Gloucester airfields, once captured and improved, were to support the Australian drive—but not the air offensive against Rabaul. All that said, this volume also covers the rather thinly photographed role of Marine Air in isolating Rabaul’s air defenses and pummeling them into neurality from mid-December 1943 to the last days of the Pacific War. Military historian Eric Hammel has scoured the archives for photographs of Marines in Pacific War combat and has unearthed thousands of rare, many never-before-published images. 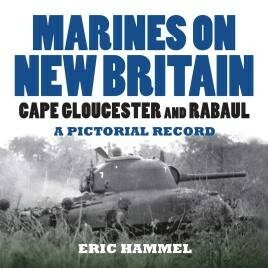 In this most-comprehensive photographic history of the Marine battles at both ends of New Britain, Hammel adds to the depth of his previous World War II Marine Corps pictorial histories. More than two hundred gripping photographs, coupled with Hammel’s brief, insightful narrative, provide a fitting tribute to the Marines who fought their way across the South Pacific. Marines On New Britain provides an engrossing and vivid pictorial account of one of the forgotten Marine Corps island conquests of World War II.